Tarsometatarsal joint, also known as the Lisfranc joint or complex, and referred to as the tarsometatarsal articulations refer to the place in the foot where the metatarsal bones—the long bones leading to the phalanges, or toes—meet and articulate with the tarsal bones of the midfoot and rearfoot that make up the arch of the foot, which include the medial, intermediate and lateral cuneiform bones, and the cuboid bone. The tarsometatarsal joint area is a complex region of bone, ligaments, cartilage and other tissues that help provide stability in the arch of the foot and for walking. Tarsometatarsal is sometimes misspelled as "tarsometatarsal" (likely because of the relation to the tarsal bones of the foot). Injuries to the tarsometatarsal joint are sometimes called Lisfranc injuries. They occur most often in athletes, such as runners, soccer and football players; automobile accident victims; horseback riders and those in the military—generally groups that move with a lot of foot action, often involving twisting motions. However, these injuries can be caused by something as simple as a misstep on a stair or stumbling over a foot that is flexed forward, or from severe impacts and trauma from falls from a height. Tarsometatarsal joint injuries usually occur with a twist and a fall and result most often in damage to the cartilage in the midfoot. Untreated, injuries can lead to flat feet and arthritis. Sprains where one or more ligaments in the joint and midfoot area are stretched. Fractures, including chipping of bones in the area. Dislocation of one or more bones in the joint area. Swelling of the foot, particularly the top of the foot. Bruising on the bottom of the foot, especially in the arch, is a strong indicator of a tarsometatarsal joint injury, though bruising can also occur on the top of the foot. Tenderness in the midfoot area. Blistering in the arch of the foot. 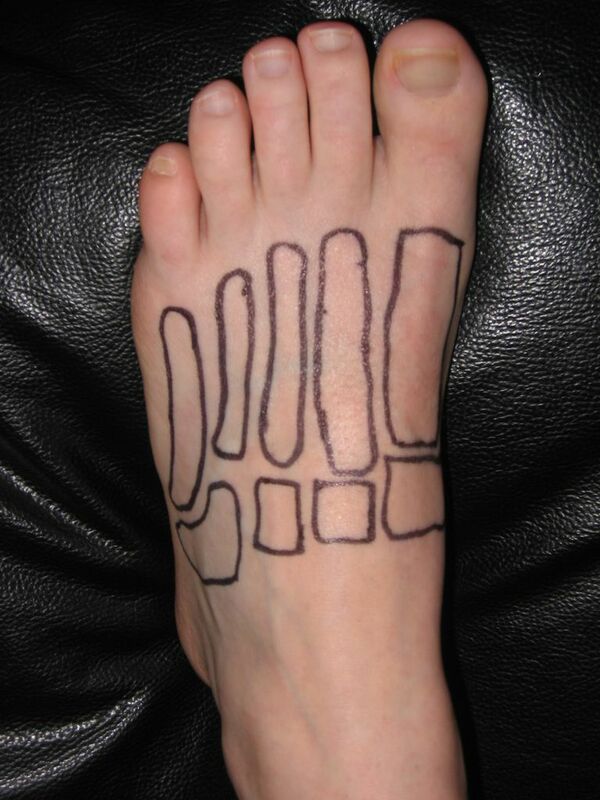 Pain across the midfoot area of the foot when standing or when pressure is applied. Pain and inability to place any weight on the foot at all. An unusual widening of the foot. Injuries of this type are sometimes mistaken for ankle sprains. If the usual application of ice while elevating the foot and rest do not seem to be reducing the pain or swelling, it is important to seek medical care for the injury. If there are no fractures involved in the injury, no ligaments are torn and there are no dislocations, treatment may be as simple as a cast on the foot for six months. Crutches will help the patient get around and keep weight and pressure off of the injured foot. After the cast is removed there is usually an orthotic boot or removable cast that is worn for a period that requires that the foot only bear lightweight. For more serious injuries, or if treatment with a cast is not successful, surgery may be required. When there is a dislocation or bone fracturing, surgery is usually necessary to realign these to ensure proper healing and avoid problems that can develop later, such as arthritis. Plates or screws may be used to hold these parts in place. In some severe cases, fusing damaged bones is necessary. In these cases, the bones are connected and allowed to heal together. It is usually unnecessary to remove any plates or screws used. Following treatment for tarsometatarsal and Lisfranc injuries, rehabilitation may be required to restore full function of the foot.